The year of the Kraken will undoubtedly be remembered as a year dominated by aggressive strategies. Cards like Tunnel Trogg, Flamewreathed Faceless, Flame Imp and Small-Time Buccaneer were all meta defining at one point or another, and consistently a common sight on ladder. In fact, it's fair to say it's been a very long time since Hearthstone wasn't dominated by aggro, with decks like Face Hunter and Zoo Warlock impacting the meta long before Standard was announced. With the heavy nerf of Aggro Shaman in patch 7.1, the rotation of three sets to Wild and the release of Journey to Un'Goro (UNG), many have speculated on the pace of the meta, have suggested it feels slower. So has Blizzard, really delivered the fabled "Control Meta"? To answer this question, we compared 67 million replays played in February (patch 7.0, MSG pre-nerf), March (patch 7.1, MSG post-nerf) and April (patch 8.0, UNG) of 2017, to identify whether the turn at which the game ends (concede or defeat) has really changed between patches/expansions. Any discussion of the pace of the meta should start with Warrior, given the effectiveness of Pirate Warrior in all three patches considered. The data suggests that Warrior was fastest in patch 7.1, when Control Warrior was least viable (thanks to Jade decks) and Pirate Warriors counter, Aggro Shaman, had felt the full force of Blizzards nerfs. Un'Goro introduced a competitive new warrior archetype, Quest (Taunt) Warrior, which slowed the class almost two full turns on average! 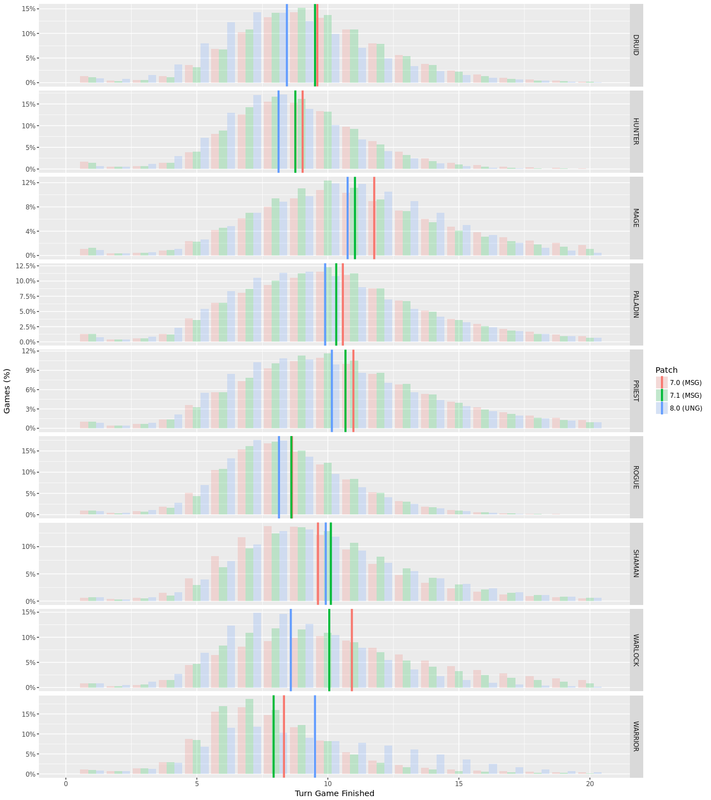 Figure 1: Percentage of games by final turn, class and patch. Solid lines represent the average turn the game finished. Only games that finish by turn 20 are displayed. Despite its recent decline, Shaman has also been incredibly relevant in Hearthstone's meta in 2017. Patch 7.1 saw a swing away from the aggro archetype (although midrange was also extremely viable in 7.0), which lead to a slowdown of almost a turn on average. Un'Goro has actually lead to a small increase in the pace of games (likely attributed to its murloc based quest decks), a theme which appears consistent across all classes except the aforementioned Warrior. All other classes have actually gotten faster with every patch. Un'Goro saw a rise in popularity of token archetypes over jade in Druid. Midrange Hunter just got a lot better, presumably leading to quicker games. Mage moved away from extremely defensive Reno archetypes, which often reached fatigue, to Tempo and now secret and aggro builds. Mid-Range and Aggro Paladin (with a murloc core) have both become tier one, where previously players preferred combo-based Anyfin Can Happen builds. Priest got some decent early-game minions and mid-range decks have appeared. Rogue has been fast for a while now, and Quest Rogue has become a popular new deck for those that like to play aggro. Patch 7.1 saw a massive increase in popularity of Zoo in Warlock, and the Year of the Mammoth rotation sealed the fate of the much slower Reno-lock. The figure below shows the pace of the meta when taken as a whole. Amazingly, matches are ending earlier with every patch, and games are currently almost a full turn shorter on average compared to February of this year! 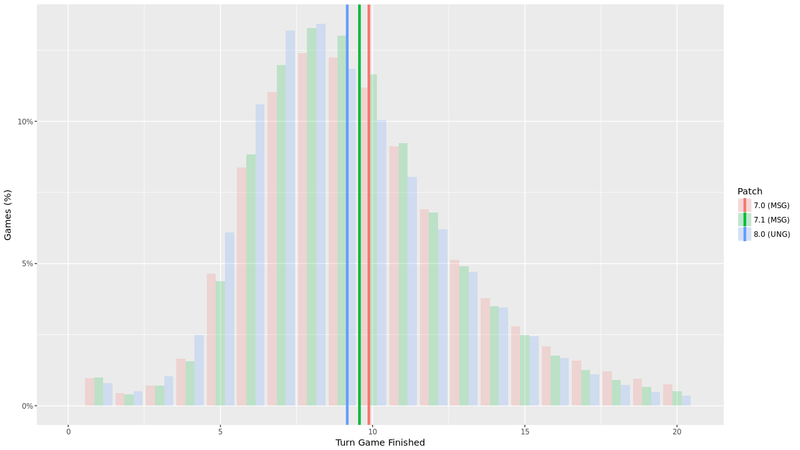 Figure 2: Percentage of games by final turn and patch. Solid lines represent the average turn the game finished. Only games that finish by turn 20 are displayed. So why might the pace feel slower or different? A frequently expressed criticism of the "Patches vs. Reno" era of hyper-agressive vs. hyper-defensive decks we saw in MSG was that a lot of games were decided by early game draw. It's this exact mechanic that aggro decks are designed to prey on; it's why they work. In Un'Goro, no class is as fast as what Warrior was in Patch 7.1, and therefore players probably don't feel quite the same pressure to draw well in the early game. In Un'Goro, the quicker games are largely driven by the slower classes getting faster, rather than a dominace of aggro. Mechanics like jade and quest actively slow you in the early game but finish it quickly once your investment pays off. Classic attrition style control decks are probably a thing of the past, as Blizzard is actively designing them out of the game. They simply can't compete with extreme value cards like Sulfuras, Drakonid Operative and Nether Portal. With this in mind, quests feel like a refinement of the jade mechanic. It's interesting to think of Jade Druid and Pirate Warrior as decks that had a similar purpose; to lower the number of games dragging out or reaching fatigue. Both of these decks achieved this; however the community reacted poorly to a meta-defined by these two polar opposites. But with quests, Blizzard found a way to tighten the end-game in more diverse ways without players feeling like passengers in the early game. It's probably part of the reason the community has reacted so positively to the set.